Classes have commenced, activities have begun to get back in rhythm, and my schedule fills up more every day. 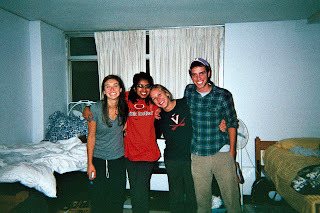 However, as I began my third year in August, I made a pact to myself and to a few girlfriends that we would do more "new and fun things" both at U.Va and around Charlottesville. The pact began and has stayed in place as we explored the farmer's market, went to art museums at Charlottesville Fridays after Five in the Downtown Mall, and U.Va commencement activities including Rotunda Sing which brings dozens of the University's acapella groups to the Rotunda. However, of all of the adventures that have taken place thus far this year, the most bold and distinct would have to be Aqua Caving. I joined Greek InterVarsity this year in hopes of getting to know a different group of people within the Greek community. Bringing various sorority and fraternities members together to discuss God, religion, spirituality, and life in the Greek system, Greek I.V. provides an outlet to discuss deeper issues and ideas with a group of new people who share similar experiences at U.Va. So far, the group worships have included amazing speakers talking about friendship, life transformations, and finding what their purpose is both at school and in life. It motivates and regenerates me every Wednesday night to go and live intentionally, which is why when the opportunity to go caving in a remote area of western Virginia presented itself, I jumped. Driving to the cave, I didn’t know what to expect. I was with two of my best friends, daringly standing by me and my “new and fun” idea. We arrived and were directed by the lifeline staff members to wear our fleece and layer up- it was going to be dark and cold with water that would feel like ice. Ten minutes later, after hiking into the woods of some unbeknown Virginian hillside, we came to a small opening in the ground. We slid into dark, freezing water that came up to my neck. I reached for my friend who grabbed my hand, and I realized I was feeling actual “fear,” something I can honestly say I haven’t felt in a long time. It was a rush of letting go of all control and the anxiety that was to follow. I was out of every element and comfort zone that my college life has afforded me, stranded in a cave with no way out but a mile forwards. After two hours of climbing rocks and wading through bitter cold water with only a small headlamp to help one see, we reached high rocks and deep water. Lifeline is an organization that helps students to grow spiritually, mentally, and emotionally as they experience nature and the outdoors. It combines adventures and inner analysis and helps participants to let go and just experience. Knowing this, I shouldn’t have been surprised when the leaders told my group that we were each going to jump off the rocks into the questionably deep water, all in the pitch black. One by one, we each took a leap of faith and let go of all control. As a college student who likes to control and overanalyze every situation, jumping off a cliff in the dark is not my cup of tea. However, as I stood on the rock by myself, I felt free. I felt like I was about to jump into a world without my brain meticulously examining and planning. Letting go of control in that cave has helped me to evaluate how I control my life. Although I know how much planning and intentionality my days need, I know going into this year that I want to be intentional about the right things. I am putting effort into my classes not for the grade but in order to learn, to challenge my mind to examine and create. I am putting most of my effort into my friendships and into being a good friend and person. I am using my time in a way that is fulfilling and will make memories. 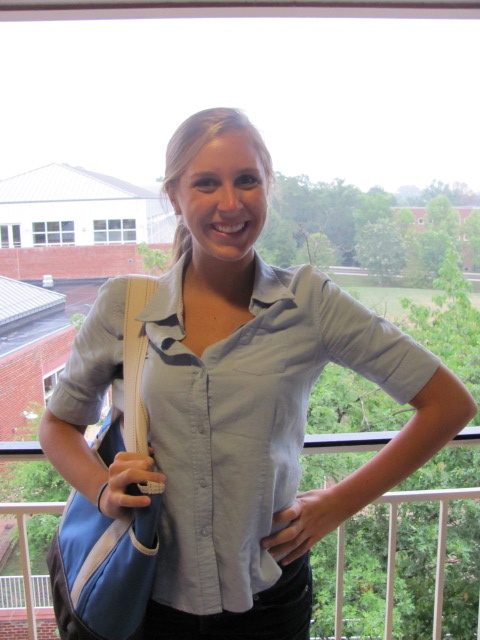 College is not a time to waste; it is not “the best years of your life” like so many say. College is the biggest challenging time of your life, it is a transition from child to adult, a time for you to grow and discover yourself. College should not be wasted; it should be embraced and enjoyed to the fullest, because schools like U.Va have so much to offer- they can challenge and guide you with the people that surround you and the activities and adventures they present. As I embark on my first Hoo Stories blog post, I have decided to begin with a brief introduction. I feel in order to understand my stories to come, it is only appropriate I provide you with a bit of background about how I ended up at the Universtiy of Virginia and how it has helped foster my passions and interests in the past three years. Coming from a military family, I could never call a place home for more than two years. So many friends, so many schools, and so many homes had come and gone. When it came time to apply to college, I realized how big of a challenge it was for me to commit to a place for an entire four years. I had so many expectations from college: I needed a challenging academic curriculum, an engaging atmosphere and student body, a beautiful campus (that provided the typical collegiate fall weather that I had dreamed of all my life), and great people that I could just have fun with. Discovering if a school has all of these qualities is no easy task. College visits helped me determine the campus, the curriculum, and of course whether the fall weather would be up to par-- red and orange leaves were a must. However, discerning the types of young adults, the range of activities, and the way of life for students was difficult. Upon touring the University of Virginia for the first time in my Junior year of high school, I found the ease of the student population perfectly balanced with the exciting and stimulating activities and academics they were engaged in. The grounds were beautiful, and the leaves were falling perfectly off the trees into beautiful piles covering the lawn. I was home. Now that you have some idea how I ended up in Virginia, I want you to know a little more about me. I am a third year in the College of Arts and Sciences getting degrees in History and the Studies of Women and Gender. I am also in the Curry School of Education getting my masters in Elementary and Special Education in their five year program for undergraduates at UVa. I have tried dozens of different activities in order to find the perfect groups for me. I participate in Sustained Dialogue, which discusses different issues relevent at UVa including "hook-up culture," race, the honor code, and stereotypes. It is the perfect way to meet a completely new group of diverse people looking to talk and share ideas. I work as the Undergraduate Intern in the Admission Office where I plan events and help out wherever I am needed. I'm in a sorority here and currently live in my chapter house. Finally, I participate in Greek IV which is a Christian group on grounds. All of these groups and friends I have made through them have helped create a home away from home for me. Every week I hope to post an activity, adventure, or story that I have embarked on that week. From the Charlottesville Farmer's Market to Dorm Sing to adventures around Grounds with friends, I know it won't be difficult to come up with hundreds of stories in the months to come! 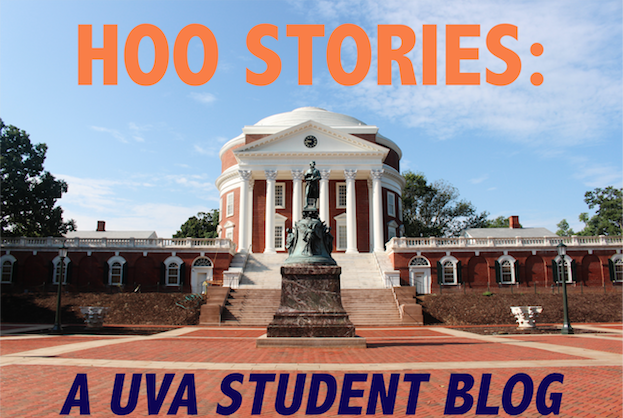 I hope you enjoy my blog and please feel free to ask any questions about UVa or Charlottesville life!